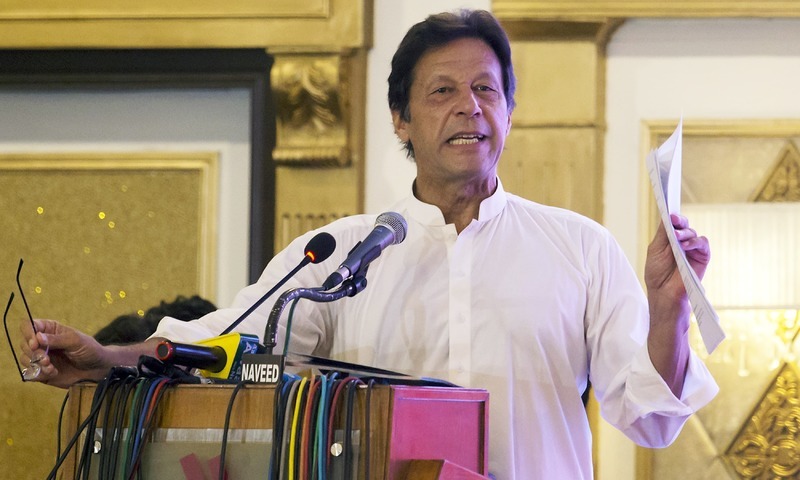 Pakistan Tehreek-i-Insaf Chairman Imran Khan on Monday unveiled his party's much-awaited manifesto for general elections 2018, announcing that he would turn Pakistan into a welfare state if voted into power. 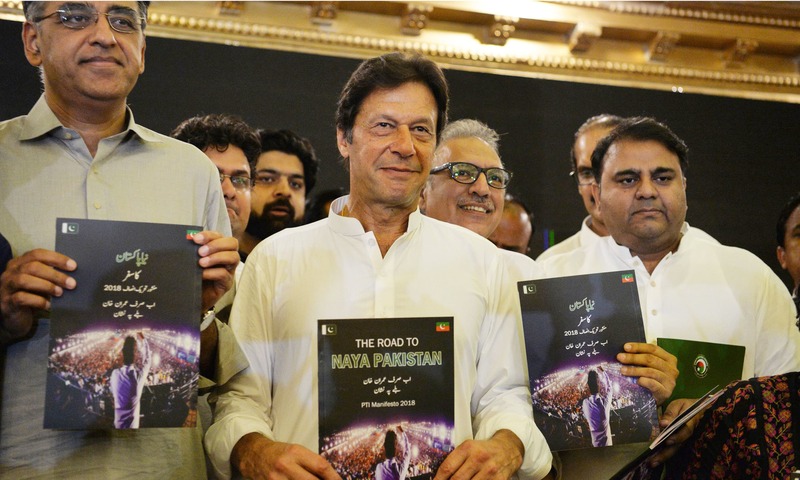 Titled "Road to Naya Pakistan", the manifesto is composed of seven chapters and explains in detail the PTI's agenda for the next government. 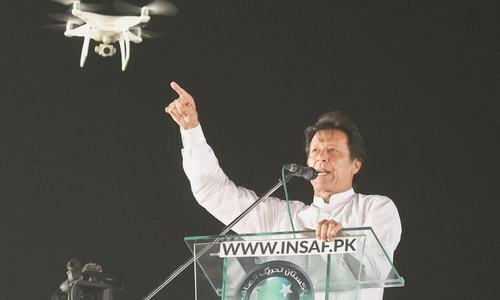 One of the primary points of the manifesto, Khan said, is to turn Pakistan into an Islamic welfare state — a model the principles of which he said are also followed in Scandinavian countries. Read the entire PTI manifesto here. "We will make the National Accountability Bureau (NAB) autonomous and pursue all cases of corruption," Khan said. "We will empower the people and devolve the power to the village level. "We will introduce a non-political model of policing like the one in Khyber Pakhtunkhwa to the rest of the provinces as well. And to ensure that Pakistanis get instant and quality justice, we will introduce comprehensive judicial reforms." Khan outlined the major issues of all the regions and vowed to resolve them. "We will bring prominent changes to the administrative structure in Karachi; ensure successful completion of Fata's merger with KP and will allocate specific funds for it; promote politics of understanding in Balochistan; raise the movement of south Punjab province, and empower Gilgit Baltistan." The PTI chief further said that his party would boost the economy by creating 10 millions jobs and promoting small-to-mid-level industries. "We will make Pakistan business-friendly and turn the China–Pakistan Economic Corridor (CPEC) into a game-changer by enhancing bilateral relations." Khan also talked about water preservation via the building of dam, which he said would make the agricultural industry profitable for the farmers. The manifesto, he said, also has plans on introducing educational reforms in schools, religious seminaries and vocational centres. PPP was the first among the major political parties to share its manifesto, followed by PML-N.
Khan said that his party would safeguard national security and defeat the terrorists' narrative, human resources, finances and weaponry to tackle the internal threats the country faces. However, he said that in order to curb the proliferation of arms and ammunition at international level, the PTI government would also invite India for strategic discussions. He also delineated his party's environmental agenda, saying that they would "plant 10 billion trees to tackle environmental changes." It seems to be a generic type of manifesto un-like PML-N's bullet form and point specific one. The PTI manifesto covers all important issues that previously both PPP and PMLN have failed to address successfully. It is a challenging task and I wish Imran Khan and his dedicated team good luck and hope to see implementation during their tenor (if elected) - give PTI a chance to prove their promises! Good one Mr Khan but you will be judged on actual performance - please don’t let us down. We want to see a Pakistan where we are welcoming our own A380s as opposed to welcoming other countries A380s and getting happy for no reason. We want to see the issue of kashmir resolved amicably with India through constructive dialogue and brotherly relations formed. No mention of foreign policy?. Even IK knows that foreign policy is not under his ambit. This man doesn't know what he is talking. he should have also mentioned that he would ensure provision of cheap electricity to businesses, as the current energy prices are beyond affordability if we want to compete with other countries to enhance our exports. InshAllah next pm ik ! We must give PTI a chance. Only party that can bring about a qualitative change that Pakistan so desperately needs. As long as PTI chief believes in theory of "electables are necessary" , there could be no room for Naya Pakistan. The situation will remain same. May be more than one person will become billionaire if PTI come into power. You need tax revenue to run a social welfare state. Generating donations for SKMH is a lot different than generating tax. They should have presented a more realistic manifesto. I have been living in Canada for the last 26 years, if Imran forms the government i will invest in Pakistan. Very socialist manifesto will take some time to change the culture. It would have been better few words on the worst condition of Pakistan economy and how to tackle this. Income tax rates are between 40-60% in Scandinavian countries and collection rates are almost 100%. That's how the welfare model works there. Who will pay the taxes in Pakistan and who will fund this Naya Pakistan? Yes he can deliver on all the promises unlike others who after coming to power usually say it was said onthe spur of the moment. Hopefully PTI will form the govt with heavy mandate and trust of peoples of Pakistan. Yes, planting more and more appropriate variety trees all over the country along constructing rapidly dams to avoid the fast incoming stifling-drought disaster. Thank you Imran Khan, our last hope. Very well said.. we all look for your progress..
Khan is the only one I would put my trust on that he will try to implement what he claims. He is a really honest guy. Wish he can change Pakistan and get a chance this time. Look at the way he is presenting, no parchi in hand because he knows what he is saying. Now PPP can not claim they are the only party to present a manifesto. I think PTI should also try to woo the business community, as their vote is very important. Before PTI came these parties never gave any impaortance to party manifesto and other basic things. Every thing he mentioned contradicts his own performance and words. Can anyone beleive in his manisfesto of NAB when KPK closed down eshtisaab commission? Also this is a big achievement that now no one presents manifesto on electricity, security, peace, infrastructures because PML N already achieved these. Hats off to PMLn and their performance. Good manifesto, covers all the basics and then some! For jobs you need investment. Do no expect a flood of outside investment in the current political and religious instability. If you could add one tenth of your tall promise, I would give you a big "A"
Fantastic!! You can count on my vote. Great manifesto and wonderful plans but who will implent them if PTI comes to power? Unfortunately, except Imranullah Khan Niazi, other "movers and shakers" in PTI are like fake currency, which might backfire when it matters most. Wishing you all the best kaptaan!! Hopefully, This time Imran Khan will actually bother attending NA sessions. Does any other political party in pakistan have a manifesto? People of Pakistan please give IK a chance!!!! If they bring legislation to apply Zakat as Tax on everyone; Every thing will fall in place. In the end its the Economy that will make life better for everyone in Pakistan. Unfortunately not even 10% of this manifesto can be inplemented without winning in all 4 provinces. Welcome to the world of 18th ammendment. Pl don't limit yourself to call it naya Pakistan for developing small infra. Pakistan can change only if science education is given to all of its citizens. Whoever comes to power will first have to first have to make sure issues of corruption are addressed and eliminated. Pakistan cannot afford to lose more of hard earned capitol to money laundering and overseas transfer. Imran says will turn Pakistan into an Islamic welfare state if voted into power. I think we all knew that. He is a populist and a socialist. It is a little scary with Pakistan's economy balanced on the edge of the cliff. He won't win any points with the IMF. So I hope his tax plan works out. It is difficult to say if that statement will help him or hurt him. Absolutely nothing new, every single politician has claimed that they would do the same that he spoke off, yet here we are 70 some years later still struggling to stand on our own feet. Pakistan needs a democratic military ruler, a new political model, where the military rules but elected through the people. Wish you all the best Khan sahib, You have a monumental task ahead of you. Mr. Khan, Your manifesto is good. Best of luck. Imran Khan has dragged religion into the manifesto as well. This dangerous use of religion for political purposes will have far reaching consequences. I liked PML-N’s manifesto, very much doable. Well sounds good on paper. Let’s see if the implementation is as sound. Good luck in the elections hope you win! Political parties must be judged by evaluating their past performances in their respective constituencies and not by their election manifestos. Manifestos are nothing but a list of grand lies. No party in the history of our country has ever fulfilled their manifesto commitments. Never. Great Khan. Pakistani nation stands with you and fully supports you. Vote for positive change, Vote for PTI. Captain charisma u the best man to lead Pakistan. Hope our country turn around and become a great example for all Muslim world. Very laudable agenda that suggests the right steps for Pakistan. Don't know if even 1% of this will get implemented. Same experience in India as well. Looking through the itinerary of main features of this optimistic manifesto,it is a very tall order to accomplish visualizing the ground realities.With cuurent accounts deficit sky rocketing, FE reserves touching a critical level,water crises hitting the very foundation of agricultural based economy, foreign investments going through stagnation stage, gas prices going up & GDP going down,one wonders with economy in real bad shape, how he would be able to create 10 million jobs. Realistically speaking, his government’s first step would be to seek further loans from IMF to buoy sinking economy, which would not be an easy affair, while Moody has already down rated the ecomony index to negative.In fact, the approval of such loan will come with lot of conditionalities, & with looming debt servicing of previous heavy loans of more than 70 billion taken by two previous governments,starting in January 2019, how we will tackle the burgeoning economic issues, PTI manifesto is dead silence about. IK will develop Pakistan as the 2nd biggest economy in the world after China. Kashmir will become part of Pakistan under IK's rule. Another Arvind Kejriwal of Delhi. Big talk to win election and then do nothing after winning. Security situation in KPK was fixed by the military and NOT the Police! Stop taking credit for it. Other than the USAID funded and managed Sihat Sahoolat Programme, don't think PTI can take credit for much! You can keep on dreaming because you may have the will but DO NOT have the capability and team to deliver any of it! Do you know what an Islamic welfare state will look like, or are you just uttering the same words which have been passed on by the previous regimes, just to gain public confidence and trust, thereby coming into power? This is the best manifesto that can lead Pakistan to a path of sucess and prosperity. Please people of Pakistan atleast vote and give first chance to PTI. He is more better than other who have looted this country for generations. Very comprehensive manifesto, covering just about every subject! Compared to failures of PPP and PML-N he is bound pleasantly surprise anyone, should his party win. At the very least, we don't expect him to loot and plunder the nation to buy castles and flats in London. Where is his foreign policy? InshaAllah history will get repeated and PTI will again cry 5 years after losing the elections to PMLN and MMA in almost all the seats. What a load of empty promises. I hope IK does not turn out to be yet another politician with false promises. You can run a welfare state if you have the necessary income (tax collection). This is not possible at the moment. People don't pay taxes. Significant changes in attitudes need to occur for anything to materialize. People are hung up on IK's charisma, but there will be unintended consequences. Children will have to go to school, teachers will have to show up on time and teach. Adults will have to report to work on time and stay till mandated time (police, bankers, utility workers, etc). Pay may not improve immediately. Taxes would have to go up and collection verified. Changes are coming for sure...I hope the Pakistanis are willing to break their bad habits and work with their new leader for a Naya Pakistan. Otherwise.... this is just a dream. I was not much inspired by first 100 days plan but PTI manifesto is lot better than the other 2 big parties. If PTI wins the election and succeed implement 60-70% of the manifesto, this will turn around the country. Investing on people and system is lot lot more important then do some big ticket disconnected projects ignoring everything. JOB number one for any party coming into power should be "Root out corruption from Pakistan"
He didn’t tell how he will do this all?? Without economic expansion and growth in tax collection, the government has no money for social welfare. Any improvement in economic indicators will be nullified by the population explosion taking place in Pakistan. Welfare State concept became unsustainable in the small countries with high taxation like the UK as it became a magnet for the millions of refugees and immigrants who wanted to benefit from the welfare state benefits, and that resulted in social unrest and Brexit. Make sure you understand what you are promising to your voters. Where will he get money to do all this. Any idea? This man should be given opportunity. I have hopes from this man. This is the chance for Pakistanis to bycote both PPP and PML-N and elect PTI. I will be happy person even 75% of his manifesto is implememted. You forgot to mention the most important things:We will enact laws to control expinential population growth and make genuine attempts to root out extremism from pakistan. Planting 10 billion trees looks to be only practical good move. For all other proposals, Mr IK will need money. But question is from where money will come. CPEC is not game changer for Pakistan, soon it is understood, better it will be for Pakistan. 10 Million jobs, 500,000 houses etc etc. Absolutely unrealistic manifesto. Sounds good. Let's give him a chance too. @Faisal Completely agree with you. Both PPP and PML-N have been in government off and on for the better part of the last three decades. There is no reason to keep voting for them again and again. Give the PTI a try and if they too fail us as a nation then by all means kick them out. But don't condemn then without even giving them a chance. Turning Pakistan an Islamic welfare state. Yes like you have turned KPK as great Islamic welfare state. Mr Khan do you think people in Pakistan are blind, we all know U have no shame lying and saying whatever to win election. We need to give him a chance because there is no other party better than PTI in the current situation. I wonder what economic policies will they adopt and what are they going to do to get off loan? Islamic Welfare State on Scandinavian model? How about personal freedom which are practiced in Scandinavian countries. By the way, citizens of Scandinavian countries do pay their taxes, at almost 50% of their income. Would you do that in Pakistan? What does he has to say about such projects in KPK during PTI regime for the last 5 years, particularly his manufactured Ehtesaab Commission? No action ... Just talk. TV anchors are playing very negative role for the country by protecting the corrupts in the name of democracy. People must support Imran Khan to get rid of corruption. Sadly no mention about education and healthcare as separate topics. @Saif Zulfiqar this a chance for Pakistanis to boycott the entire elections and give a clear message that Pakistanis will only accept real elections and not selections. NAB should be given constitutional protection with absolute autonomy and independence. No motorways, no roads, no metro buses, sounds like pakistan will do very nicely without them unless of course you own the compnies that got the contracts from paying kickbacks. A visionary leader who should be given an opportunity to prove himself. PTI can wrap up the Karachi vote by promising to make Karachi a separate province. In fact, we need 20-30 provinces and give autonomy to each province to implement federally mandated targets on education, health, welfare, security, etc. The federal government's job should be to set national standards and then to ensure that each province meets those targets. Give him a chance, if he is corrupt or can’t deliver kick him out in next election. But he must be tried, I am an ex N league supporter. What a manifesto! rock on! What percentage of population knows the concept of 'manifesto'. I am afraid he would go unappreciated, although I wish him success. He must be given the chance to demonstrate what he can do. I am confident that he could not be any worse than the PML(N) and the PPP who had enough opportunities but abused each one of them. I don’t care about political parties but I do care about what they do to the nation . Now Pakistan’s survival is at stake please give Imran Khan a chance to put his ideas and manifesto into action. Review his actions after 5 years! How will you give 10 million jobs? Where will the money come from? Country has n money and is borrowing to pay the interest. This is a wonderful opportunity for Pakistan to take app alternative destructive course led by the two feudal families. Indeed it can be a game changer. Malaysians have taken a bold step, will Pakistanis follow suite? Not sure we will? We have to many corrupt people in the system. Pakistani nation must exercise due diligence in the upcoming election which is a turning point in the nations history ! 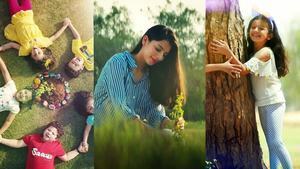 The only political party in Pakistan which has concerned itself with the environment. The only political party that talks about devolution of power in it's true sense down to the common man. Imran Khan and the PTI deserve a chance. @Amin. I have a blind faith in Khan. He cannot be a cheat or liar. He is a determined and committed leader and a real fighter till last ball. He has won hearts of the masses. Let's give him a chance without any fear. @Jay "How will you give 10 million jobs? Where will the money come from? " It's not the money that creates work, but work that creates money. He didn't tell how he'll incentivize the work though. Looks like his presence on PM seat is sufficient for that!! !